The BMW i3 was officially unveiled in London today with the all-electric car boasting a 100 mile range and an iPhone app which will let you control certain aspects of the car. Unveiled as the 'world's first premium electric car' the i3 has been designed as the ultimate city car boasting a state of the art interior featuring dual colour screens. 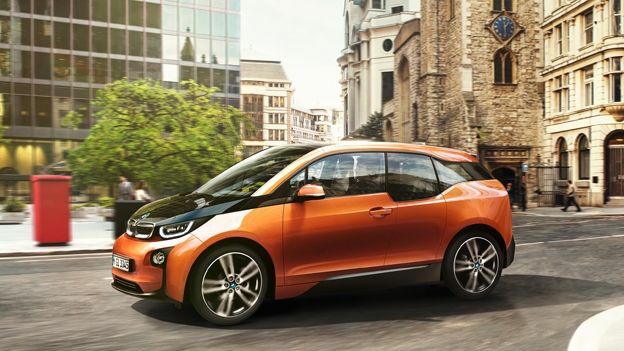 With the average daily commute set at around 13.1 miles each way the i3 has been built as a response by providing an eco-friendly alternative to driving around the city. Under the bonnet there's a powerful electric motor which produces 170bhp giving the i3 an impressive 0-62mph of 7.2 secs. For those worried about range the i3 also comes in a version which features a range extender. Using similar technology to that found in the Vauxhall Ampera the i3 Range Extender uses a tiny petrol generator which then keeps the battery at a constant level of charge. The interior features a specially built version of BMW's ConnectedDrive system which features two displays, one behind the wheel and another mounted in the middle of the dashboard. These can then show anything from accurate range readings to navigation. The car also comes with three different driving settings, Normal, ECO PRO and ECO PRO+ which change how the car responds increasing range and efficiency. Outside of the car there's the new BMW i Remote iPhone and Android app which, when connected to the car will let you check battery levels and change the climate control to allow defrosting before you leave the house. It'll also come with a navigation option letting you send destinations to the car before you've even got in, the i3 will then in turn send alerts to the app if, say, the wiper fluid level is low. The BMW i3 has a UK release date of November and thanks to the UK electric vehicle grant it starts at £25,680 for the all-electric version which then goes up to £28,830 if you want the range extender as well.